Updated Fri., Dec. 19, 11:25 a.m. EST: The school has been identifed as Godby High School in Tallahassee, Fla. The Shmoney dance was made popular by the rapper Bobby Shmurda, who is currently dealing with some hefty legal issues, but it’s just about everywhere, and everyone is doing it—even high school marching bands. A high school drum major just gave every Drumline movie a run for their money. The unknown student proved once again that hip-hop culture is everywhere, even the drum line. 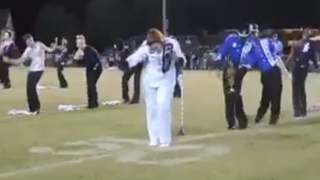 As the student led the band, she did the Shmoney dance not once but twice. At the end of the video, the entire drum line joined in and the crowd went wild. It’s hard to figure out the name of the school from the uniforms, but it’s safe to say, whatever school this is, its band will probably keep this routine in its repertoire.